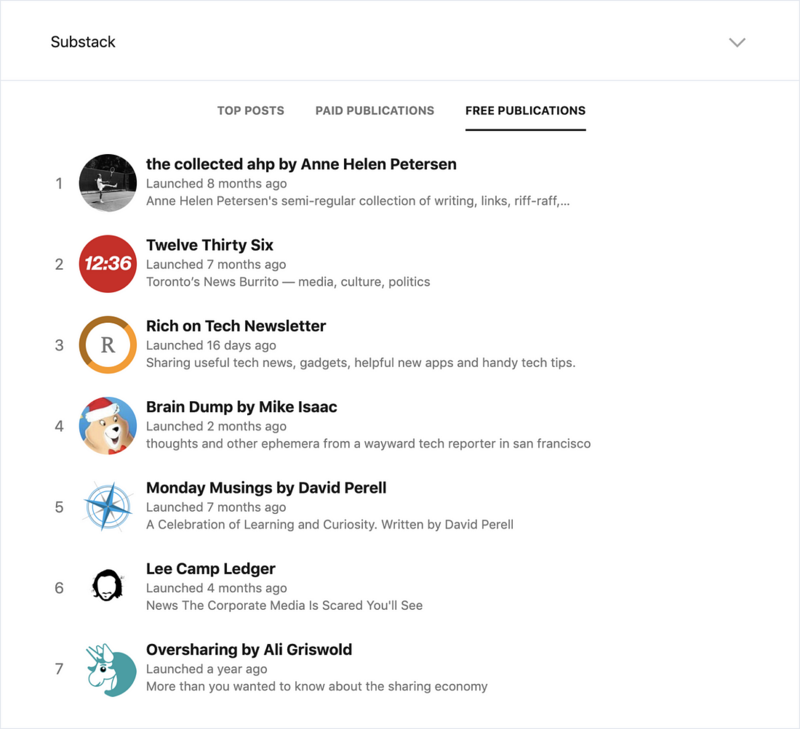 Last week, we launched publisher leaderboards on substack.com to help publishers find new subscribers and subscribers find great publishers. We’ve received a lot of good feedback since the launch, but a few people worried that the leaderboards could turn Substack into a popularity contest. That’s understandable. At first glance, they look a bit like the algorithmic feeds on other social networks that cause people to compete for attention. But the problem with algorithmic feeds is not that they use an algorithm. The problem comes when the algorithm rewards bad behavior. When you optimize for superficial engagement, you get clickbait, outrage, and addiction. For some companies, that superficial engagement is where the money comes from. At Substack, because we don’t serve ads, we don’t make any money from superficial engagement. Instead, we make money when readers decide to pay publishers, by taking a cut of the revenue. We like this model because it means we only do well when publishers do well. Consequently, we want to do our best to help publishers find more (paying) subscribers. The leaderboards are one step towards that, but we are being careful not to mess things up. We want to make sure that the rules that drive the algorithmic feed are based not on superficial engagement but on value. The beauty of a publishing ecosystem based on payments is that you can get a sense of value by looking at what subscribers like. We want to design our leaderboards – and every feature we build – based on good rules, where attention is valued instead of exploited. We want to amplify the work that readers are happily paying for. This is obviously easier said than done, and we know the first versions of these discovery tools won’t be perfect. But we are taking steps that we think will help. For a start, we don’t look at what drives clicks. Instead, we look at signals that indicate reader satisfaction. For the free publications, that means we rank according to active readership. For the top paid publications list, we focus on revenue, which serves two important purposes: 1) It shows what readers deeply value; and 2) it gives other publishers a clear idea of what’s possible on Substack and how to get there. For the top posts list, we focus on how many times a post has been “liked.” But there are no like buttons on the leaderboard page for a reason: these aren’t simple drive-by upvotes. The only people who can like posts are a publication’s free or paid subscribers. We attribute greater significance to the likes from paying subscribers because we think the satisfaction of your most invested readers is the best measure of success. As a matter of principle we believe that publishers and their subscribers should get to determine the terms of their relationships. That’s why publishers on Substack set their own prices, and why they can leave and take their mailing list, content, and payment relationships with them any time they want. And that’s why publishers can opt out from not only the leaderboards but also the community features (likes and comments) generally. When you buy a subscription to a publication, you are making a considered choice. Rather than refreshing a feed in search of a dopamine hit, you are deciding that you want to bring the publisher’s voice into your mind. This dynamic is the antidote to the attention economy because it puts your best self back in charge. The leaderboards are just one initiative in a larger project of helping independent publishers succeed, and although we hope we’re headed in the right decision it is likely we’ll make some mistakes along the way. We are grateful to the people who have given us feedback on this, both positive and negative, and will continue to listen. Please feel free to leave a comment or email us at hello@substack.com. While I'm fine with Substack having a leaderboard and understand why you want one - the "big names" attract more interest and new customers, for one thing - I also think you should seriously consider some of the criticisms from Jesse in the threads here. While I don't agree with all of what Jesse wrote, he makes some of the same points I came here to make. First of all, I greatly miss the "new public posts made in real time" discovery tool. I used it regularly, and found some very interesting writers that way. I was hoping you'd develop a robust search tool that would enable me to search all Substack newsletters by subject matter and/or keyword, but I figured the real-time posts discovery page was a step in that direction. I didn't worry about it too much because, well, you're in beta. Eventually you'd have a keyword search tool of some sort, right? But this leaderboard that displays only the currently popular writers - combined with the loss of the real-time new posts feed - is NOT a good sign. If you kept that real-time discovery tool AND the leaderboard, I wouldn't be worried. I have niche interests. I'm not interested in any of the subjects currently being covered by writers on the leaderboard. I want a tool to find great writers who cover obscure topics and maybe don't have the level of PR skill or name recognition that your top writers have, so they'll never show up on the leaderboard. Many of those writers are the ones who are most in need of financial support and assistance in reaching potential readers! Are you going to help us find THOSE writers, Substack? Please say yes. I've been here a year already, I left Patreon for Substack, and I still love your platform. I really, really want to keep on loving it. I hope you'll eventually have a keyword search tool. Very interesting, I like that you're trying new things and explaining what you're aiming for here. With there being two goals at once — "to help publishers find new subscribers and subscribers find great publishers" — it strikes me that it may be really hard to achieve both with a single discovery mechanism, but seems like a good thing to experiment with. One thing I think is worth keeping in mind is that, even if the algorithm doesn't reward bad behavior, it may still have biases. One example I'm thinking of might be bias against new creators. Ranking based on revenue or subscriber counts seem like it could bias toward early adopters / those who have most subscribers already. Some alternatives could be using other factors like growth trajectory, conversion rate, or e.g. the ratio of likes to total subscribers rather than absolute numbers. Basically, ways to recognize quality as separate from metrics tied to quantity. Look forward to seeing more experiments / new features in the future!